he Hubble Frontier Fields (HFF) program has been recently extended to include two additional clusters to this spectacular data set. This is great news for science. To date, the HFF has provided the best data set to study the distribution of dark matter in galaxy clusters (the same data set is used for other exciting projects). Currently, the HFF is covering two clusters (from the original set of 4). One of them is MACSJ1149.5+2223. This cluster is interesting for several reasons. One of them is the fact that a supernova at z=1.491 was observed by Hubble in one of the observing campaings. This supernova is seen 4 times, in a configuration known as Einstein cross. The multiple images observed by Hubble are distorted versions of the original supernova that are multiply lensed 4 times (gravitational lensing). One interesting feature of gravitational lensing is that since the paths of photons are distorted by the gravitational potential, and so is their time of arrival to our telescopes on earth. Because of this time difference, multiply lensed images of the same background object are seeing in different epochs. Is like seeing your kids simultaneously when they had different ages, … weird. The supernova observed by Hubble is observed (4 times) in one of the arms of its host galaxy in just one of the counterimages but not in the other two counterimages. This means that that supernova will be observed in the future in the other two counterimages or it has already happened in those two counterimages. Since the lifetime of a supernova is short (days or weeks) and there is no way to predict when a star will go supernova it is nearly imposible to observe a star going supernova before it happens. The multiply lensed images of the supernova in this cluster, could in theory, allow us to predcit when a supernova is going to be observed and study the supernova explosion from the very beginning. Using accurate models of the gravitational potential we where able to predict the time difference between the different counterimages and predict when the supernova will be observed next in the different counterimages or when it was happening in those images. The figure shows the predicted time delays for the supernova observed in MACS1149. This supernova is observed now four times. Our model predicts that we are too late to observe one of the counterimages that occurred about 9 years ago but a new chance to see this supernova will take place again around November 1st 2015. This will be the first time we can point a telescope to a position and wait for the SN to happen (again). Talk about time travel ! On December 12th 2015, news broke about the reappearance of SN Refsdal at the exact predicted position posted in this article. The date of the explosion is uncertain by one month but it must have happened between November 15th and December 10th which are the dates when Hubble was observing at this location. On the November 15th observation there was no sign of the explosion but in the December 10th observation the SN had already shown up at the predicted position. The date of the original prediction (November 1st) is based on a value of the Hubble constant that is a bit out of date (h=0.7). Adopting a more recent estimate (h=0.67) and re-scaling the time delay, the best prediction for the reappearance shifts from November 1st 2015 to November 17th, right in the window of time where we know the explosion had happened. When was the first time you noticed you where in the 21st century? For some of you it may have been when you owned your first smartphone, or your first electric car, or your fancy 3D TV or 3D printer, or maybe when you tried the google glass? Those are cool little things that may impress you for a while but hardly they’ll make it into the history books. Now really, when was the first time you had a sense that things had already changed? For me that day was this week when I saw this picture. It does not just tell a story, it shows the change that will dominate the 21st century. The Indian Space Research Organisation succesfully put in orbit a small satellite around Mars. 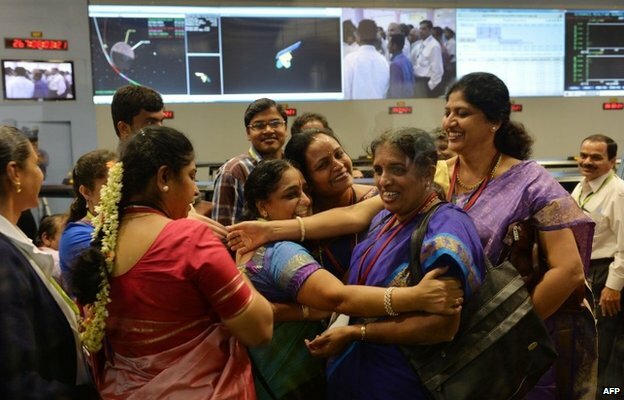 The picture shows a group of female scientist/engineers celebrating this tremendous achievement. This picture illustrates the game-changing rules of the 21st century. First, the definite raise of Asia as a superpower in the world. Space missions are normally used by governments as powerful messages to the world. Very few things have the power to bring the attention of the world (in a good way) as a successful space mission. One of the reassons why governments choose space missions to demonstrate their power (economic, technological, militar and even political) is that you can not cheat in space. You either have the will and technology to be succesfull or you don’t. India, together with its Asian neaighbours, is destined to play a leading and fundamental role in the 21st century. But even more imporant, is the second conclusion that we can get form the picture above. What comes to your mind when you think of a rocket scientist? Well, think again. Women also, are destined to play a fundamental and leading role in the 21st century. The 20th century was full of promisses for women, some of them only partially fulfilled. Now reality is here. If one thing will define the 21st century it won’t be the defnite raise of Asia, but the definite raise of women. MOND and Dragon Kick galaxies. MOND (MOdified Newtonian Dynamics) models are popular among some scientist because they avoid one of the biggest problems in cosmology, dark matter. This misterious substance remains undetected although there is evidence from several observations that it must exist and in vast quantities. MOND models are able to explain some of these observations by modifying the laws of gravity. In particular, at cosmic distances MOND models propose that the gravitational acceleration does not decay as the inverse of the distance squared but at a smaller rate. This slower decay of the gravitational acceleration would effectively describe some of the observations without the need to invoke the existence of dark matter but it also has its own problems, like fine tunning of the parameters in the models. Together with some collaborators, we recently studied a particular galaxy behind the cluster MACS0416 that is gravitationally lensed (or bended) by another galaxy in the same cluster. We named this galaxy the Dragon Kick galaxy because it rejects the MOND hypothesis and confirms the pressence of a halo of dark matter around the lens galaxy. The Dragon Kick galaxy is shown above as a blue arc that is super-impossed on the legs of our would be Bruce Lee. Our results will be made public next week but basically we find that the lens galaxy (shown above as a yellowish edge-on galaxy emerging from the private region of our Bruce Lee) requires a halo around it that aligns perpendicularly with the lens galaxy in order to explain the shape of the lensed blue arc (the Dragon Kick galaxy) . The mass of this invisible halo (the dark matter) is larger than the mass of the lens galaxy and in agreement with what is expected from the standard model that assumes the existence of vast amounts of dark matter in the universe. More Dragon Kick galaxies are expected to be studied soon that could help in providing new clues about the nature of dark matter. Science in the 21st century. 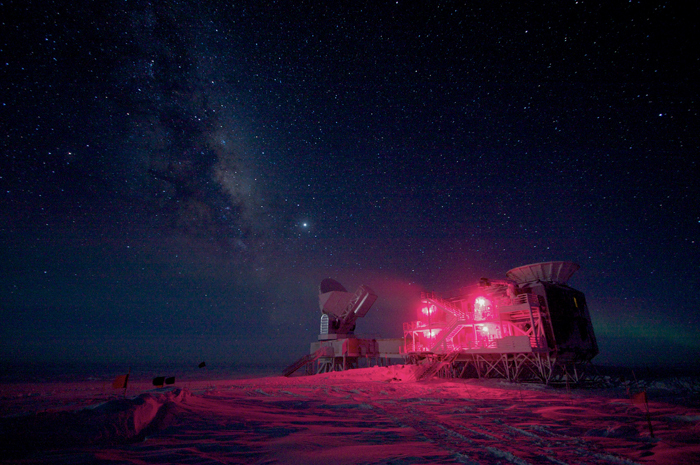 What can we learn from the BICEP2 experience?